They all seem to be pretty similar. They are all very cheap, and they are all supposed to be suitable for use as routers on typical consumer broadband Internet links. So how far can you push them? I decided to do a few tests. Note: I seperately tested the builtin ethernet switch alone (without going through the router) with the source ans sink both attached to the same vlan. 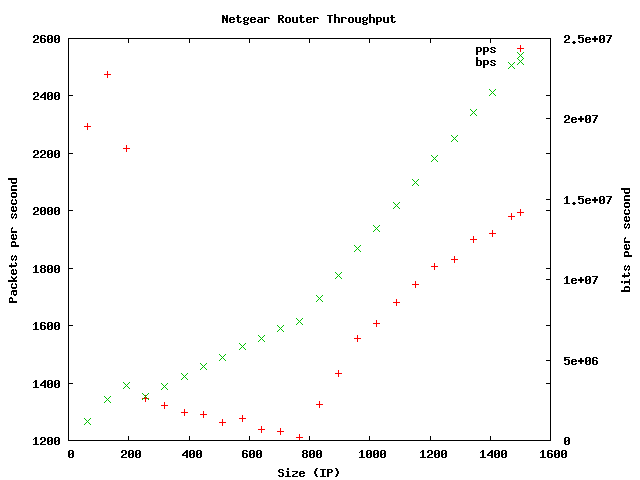 netperf could only generate a wirespeed flow with packet sizes greater than about 500. It took everything I threw at it, which was wirespeed for sizes greater than this, and as much as netperf could generate for sizes less than this. There appears to be a much faster path for packets less than about 200 bytes, which is nice since so many packets in typical traffic fall in that category. The performance drops drastically after that. 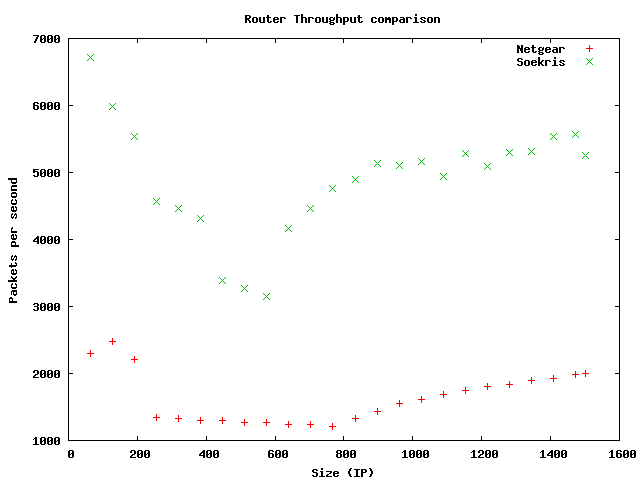 Surprisingly, it starts to go up again linearly with packet size around 800 bytes. I am not sure why it would be able to transmit more packets per time interval when they are larger, but it seems to be true: the test appears to be valid, the numbers reported by netperf and ethereal match exactly. then you should expect about 8Mbps (total in + out) for typical Internet traffic. Enough for your average cable modem or plain ADSL, but not sufficient for ADSL2+ or other faster broadband services. Let's compare this with something that is about two and a half times the price of the Netgear router. 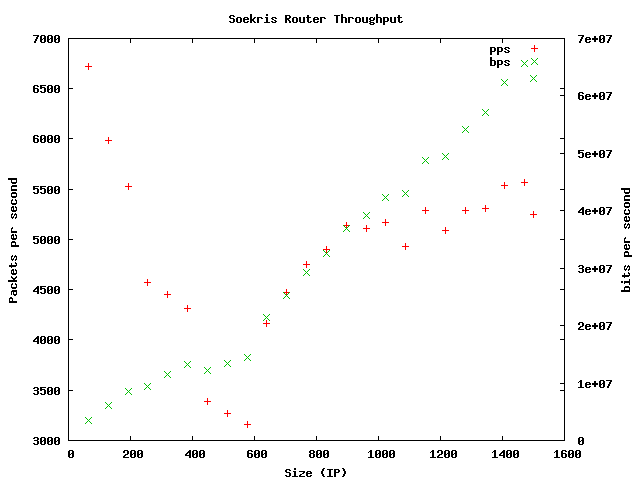 The Soekris shows a bit of the same pattern as the Netgear with small packets performing well and the performance increasing after about 600 bytes but it doesn't show the strange linear increase after that. Using the same histogram, you should expect to see about 22Mbps for typical Internet traffic. The price appears to be proportional to the performance!